LeBreton Flats watchers reacted with surprise and frustration Thursday as signs emerged that the National Capital Commission's carefully managed plan to redevelop the federally owned lands could be teetering on the brink of collapse. The Crown corporation responsible for the 20 hectares of land west of downtown said Thursday that the Ottawa Senators-backed Rendezvous LeBreton Group has been unable to resolve internal partnership issues. The NCC's board gave Rendezvous LeBreton until its next meeting in late January to resolve its problems, or it will begin a new process to develop a plan for the land. Ottawa Mayor Jim Watson said he'd seen signs that the relationship between Senators owner Eugene Melnyk and Trinity Group chairman John Ruddy was strained. "Let's put it this way, it has been a challenging relationship," Watson said Thursday. Dalhousie Community Association head Michael Powell would speak for the neighbourhood that the NCC wants to see built on the land, and said it was surprising the two partners couldn't "decide how to split up a very big pot of money." "We very well could go back to square one," Powell said. "I'd like to see something there before I am old and grey." 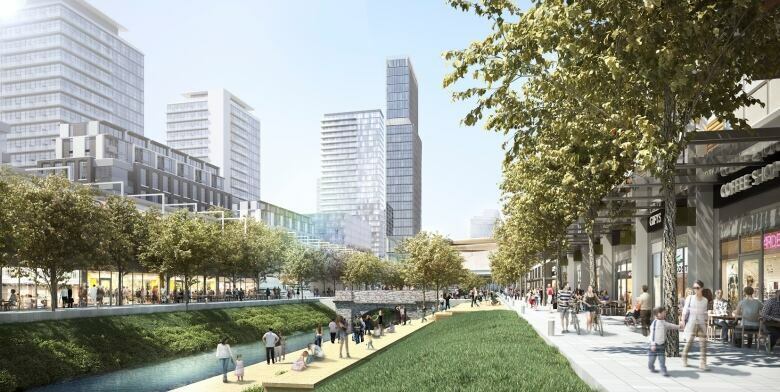 Earlier this year, the NCC struck a deal in principle with Rendezvous LeBreton to build a new NHL arena, an accessible community centre, 4,000 units of housing, a French-language public school and public space. At that time the project was valued at about $4 billion. The University of Ottawa's Eric MacIntosh, a researcher in sports management and organizational behaviour and a close watcher of the Ottawa Senators, also reacted with disappointment to Thursday's news. He called the news out of the NCC meeting a shock, arguing that "negative energy" around owner Eugene Melnyk over the last two years is likely playing a role in the deteriorating business relationship. The Senators have struggled to fill their arena in Kanata, and in December Melnyk threatened to move the team if ticket sales didn't improve. He has since stated he has no relocation plans. MacIntosh called the NCC's public announcement a "pressure tactic" meant to force the Trinity Group and the Ottawa Senators to get over their differences. Anyone hoping to see a hockey arena built in Ottawa's downtown core now has good reason to be pessimistic, he added. "Three years is a long time to be able to get things together," MacIntosh said. "I don't know what the future holds but right now it's bleak in my opinion." The NCC would also share some blame, MacIntosh said, if the Rendezvous proposal fails in January and the commission doesn't offer Devcore, Canderel and DLS Group — which came in second during the original bidding process — to develop the site. "If they don't, they look pretty foolish," he said. David Gork has lived in a condo overlooking LeBreton Flats for the past five years, and said he's now resigned to another decade living on an the edge of an underdeveloped field. He said he always believed DCDLS had put forward a superior bid, and thought the NCC should have chosen it from the start. "They ended up going with the one that was a piece of crap, and now nothing's happening."